Liczba stron: 146 Jest to ujednolicona liczba stron, która ułatwi Ci porównanie długości książek. Każda strona Legimi to 200 słów. One man may have “zeal without knowledge,” while another may have knowledge without zeal. If I could have only the one, I believe I should choose the first; but, with an open Bible, no one need be without knowledge of God’s will and purpose; and the object of this book is to help others to know the source of true power, that both their zeal and their knowledge may be of increased service in the Master’s work.Paul says, “all Scripture is given by inspiration of God, and is profitable;” but I believe one portion, and that the subject of this book, has been too much overlooked, as though it were not practical, and the result is lack of power in testimony and work. If we would work, “not as one that beateth the air,” but to some definite purpose, we must have this power from on high. Without this power, our work will be drudgery. With it, it becomes a joyful task, a refreshing service.May God make this book a blessing to many. This is my prayer. POWER—ITS SOURCEIn vain do the inhabitants of London go to their conduits for supply unless the man who has the master-key turns the water on; and in vain do we think to quench our thirst at ordinances, unless God communicates the living water of His Spirit.—Anon.It was the custom of the Roman emperors, at their triumphal entrance, to cast new coins among the multitudes; so doth Christ, in His triumphal ascension into heaven, throw the greatest gifts for the good of men that were ever given.—T. Goodwin.To unconverted persons, a great part of the Bible resembles a letter written in cipher. The blessed Spirit’s office is to act as God’s decipherer, by letting His people into the secret of celestial experience, as the key and clew to those sweet mysteries of grace which were before as a garden shut up, or as a fountain sealed, or as a book written in an unknown character.—Toplady.The greatest, strongest, mightiest plea for the Church of God in the world is the existence of the Spirit of God in its midst, and the works of the Spirit of God are the true evidences of Christianity. They say miracles are withdrawn, but the Holy Spirit is the standing miracle of the Church of God to-day. I will not say a word against societies for Christian evidences, nor against those weighty and learned brethren who have defended the outworks of the Christian Church. They have done good service, and I wish them every blessing, but as to my own soul, I never was settled in my faith in Christ by Paley’s Evidences, nor by all the evidence ever brought from history or elsewhere; the Holy Spirit has taken the burden off my shoulders, and given me peace and liberty. This to me is evidence, and as to the externals which we can quote to others, it was enough for Peter and John that the people saw the lame man healed, and they needed not to speak for themselves.—Spurgeon.POWER—ITS SOURCE. “Without the soul, divinely quickened and inspired, the observances of the grandest ritualism are as worthless as the motions of a galvanized corpse.”—Anon.I quote this sentence, as it leads me at once to the subject under consideration. What is this quickening and inspiration? What is this power needed? From whence its source? I reply: The Holy Spirit of God. I am a full believer in “The Apostles’ Creed,” and therefore “I believe in the Holy Ghost.”A writer has pointedly asked: “What are our souls without His grace?—as dead as the branch in which the sap does not circulate. What is the Church without Him?—as parched and barren as the fields without the dew and rain of heaven.”There has been much inquiry of late on the subject of the Holy Spirit. In this and other lands thousands of persons have been giving attention to the study of this grand theme. I hope it will lead us all to pray for a greater manifestation of His power upon the whole Church of God. How much we have dishonored Him in the past! How ignorant of His grace, and love and presence we have been? True, we have heard of Him and read of Him, but we have had little intelligent knowledge of His attributes, His offices and His relations to us. I fear He has not been to many professed Christians an actual existence, nor is He known to them as a personality of the Godhead.The first work of the Spirit is to give life; spiritual life. He gives it and He sustains it. If there is no life, there can be no power; Solomon says: “A living dog is better than a dead lion.” When the Spirit imparts this life, He does not leave us to droop and die, but constantly fans the flame. He is ever with us. Surely we ought not to be ignorant of His power and his work.IDENTITY AND PERSONALITY.In John v, 7, we read: “There are three that bear record in heaven, the Father, the Word, and the Holy Ghost, and these three are one.” By the Father is meant the first Person, Christ, the Word is the second, and the Holy Spirit, perfectly fulfilling His own office and work in union with the Father and the Son, is the third. I find clearly presented in my Bible, that the One God who demands my love, service and worship, has there revealed Himself, and that each of those three names of Father, Son and Holy Ghost has personality attached to them. Therefore we find some things ascribed to God as Father, some to God as Saviour, and some to God as Comforter and Teacher. It has been remarked that the Father plans, the Son executes, and the Holy Spirit applies. But I also believe they plan and work together. The distinction of persons is often noted in Scripture. In Matt. iii, 16-17, we find Jesus submitting to baptism, the Spirit descending upon Him, while the Father’s voice of approval is heard saying: “This is my Beloved Son in whom I am well pleased.” Again in John xiv, 16, we read: “I (i. e. Jesus) will pray the Father, and He shall give you another Comforter.” Also in Eph. i, 18: “Through Him (i. e. Christ Jesus) we both (Jews and Gentiles) have access by one Spirit unto the Father.” Thus we are taught the distinction of persons in the Godhead, and their inseparable union. From these and other scriptures also we learn the identity and actual existence of the Holy Spirit.If you ask do I understand what is thus revealed in Scripture, I say “no.” But my faith bows down before the inspired Word and I unhesitatingly believe the great things of God when even reason is blinded and the intellect confused.In addition to the teaching of God’s Word, the Holy Spirit in His gracious work in the soul declares His own presence. Through His agency we are “born again,” and through His indwelling we possess superhuman power. Science, falsely so called, when arrayed against the existence and presence of the Spirit of God with His people, only exposes its own folly to the contempt of those who have become “new creatures in Christ Jesus.” The Holy Spirit who inspired prophets, and qualified apostles, continues to animate, guide and comfort all true believers. To the actual Christian, the personality of the Holy Spirit is more real than any theory science has to offer, for so-called science is but calculation based on human observation, and is constantly changing its inferences. But the existence of the Holy Spirit is to the child of God a matter of Scripture revelation and of actual experience.Some skeptics assert that there is no other vital energy in the world but physical force, while contrary to their assertions, thousands and tens of thousands who can not possibly be deceived have been quickened into spiritual life by a power neither physical or mental. Men who were dead in sins—drunkards who lost their will, blasphemers who lost their purity, libertines sunk in beastliness, infidels who published their shame to the world, have in numberless instances become the subjects of the Spirit’s power, and are now walking in the true nobility of Christian manhood, separated by an infinite distance from their former life. Let others reject, if they will, at their own peril, this imperishable truth. I believe, and am growing more into this belief, that divine, miraculous creative power resides in the Holy Ghost. Above and beyond all natural law, yet in harmony with it, creation, providence, the Divine government, and the upbuilding of the Church of God are presided over by the Spirit of God. His ministration is the ministration of life more glorious than the ministration of law, (2 Cor. iii, 6-10). And like the Eternal Son, the Eternal Spirit having life in Himself, is working out all things after the counsel of His own will, and for the everlasting glory of the Triune Godhead.The Holy Spirit has all the qualities belonging to a person; the power to understand, to will, to do, to call, to feel, to love. This can not be said of a mere influence. He possesses attributes and qualities which can only be ascribed to a person, as acts and deeds are performed by Him which can not be performed by a machine, an influence, or a result.AGENT AND INSTRUMENT.The Holy Spirit is closely identified with the words of the Lord Jesus. “It is the Spirit that quickeneth; the flesh profiteth nothing, the words that I speak unto you, they are spirit and they are life.” The Gospel proclamation can not be divorced from the Holy Spirit. Unless He attend the word in power, vain will be the attempt in preaching it. Human eloquence or persuasiveness of speech are the mere trappings of the dead, if the living Spirit be absent; the prophet may preach to the bones in the valley, but it must be the breath from Heaven which will cause the slain to live.In the third chapter of the First Epistle of Peter, it reads, “For Christ also hath once suffered for sins, the just for the unjust, that He might bring us to God, being put to death in the flesh, but quickened by the Spirit.”Here we see that Christ was raised up from the grave by this same Spirit, and the power exercised to raise Christ’s dead body must raise our dead souls and quicken them. No other power on earth can quicken a dead soul, but the same power that raised the body of Jesus Christ out of Joseph’s sepulcher. And if we want that power to quicken our friends who are dead in sin, we must look to God, and not be looking to man to do it. If we look alone to ministers, if we look alone to Christ’s disciples to do this work, we shall be disappointed; but if we look to the Spirit of God and expect it to come from Him and Him alone, then we shall honor the Spirit, and the Spirit will do His work.SECRET OF EFFICIENCY.I can not help but believe there are many Christians who want to be more efficient in the Lord’s service, and the object of this book is to take up this subject of the Holy Spirit, that they may see from whom to expect this power. In the teaching of Christ, we find the last words recorded in the Gospel of Matthew, the 28th chapter and 19th verse, “Go ye, therefore, and teach all nations, baptizing them in the name of the Father, and of the Son, and of the Holy Ghost.” Here we find that the Holy Spirit and the Son are equal with the Father—are one with Him, “teaching them in the name of the Father, and of the Son, and of the Holy Ghost.” Christ was now handing His commission over to His Apostles. He was going to leave them. His work on earth was finished, and He was now just about ready to take His seat at the right hand of God, and He spoke unto them and said: “All power is given unto Me in heaven and on earth.” All power, so then He had authority. If Christ was mere man, as some people try to make out, it would have been blasphemy for Him to have said to the disciples, go and baptize all nations in the name of the Father, and in His own name, and in that of the Holy Ghost, making Himself equal with the Father.There are three things: All power is given unto Me; go teach all nations. Teach them what? To observe all things. There are a great many people now that are willing to observe what they like about Christ, but the things that they don’t like they just dismiss and turn away from. But His commission to His disciples was, “Go teach all nations to observe all things whatsoever I have commanded you.” And what right has a messenger who has been sent of God to change the message? If I had sent a servant to deliver a message, and the servant thought the message didn’t sound exactly right—a little harsh—and that servant went and changed the message, I should change servants very quickly; he could not serve me any longer. And when a minister or a messenger of Christ begins to change the message because he thinks it is not exactly what it ought to be, and thinks he is wiser than God, God just dismisses that man.They haven’t taught “all things.” They have left out some of the things that Christ has commanded us to teach, because they didn’t correspond with man’s reason. Now we have to take the Word of God just as it is; and if we are going to take it, we have no authority to take out just what we like, what we think is appropriate, and let dark reason be our guide.It is the work of the Spirit to impress the heart and seal the preached word. His office is to take of the things of Christ and reveal them unto us.Some people have got an idea that this is the only dispensation of the Holy Ghost; that He didn’t work until Christ was glorified. But Simeon felt the Holy Ghost when he went into the temple. In 2d Peter, i, 21, we read: “Holy men of old spake as they were moved by the Holy Ghost.” We find the same Spirit in Genesis as is seen in Revelation. The same Spirit that guided the hand that wrote Exodus inspired also the epistles, and we find the same Spirit speaking from one end of the Bible to the other. So holy men in all ages have spoken as they were moved by the Holy Ghost.HIS PERSONALITY.I was a Christian a long time before I found out that the Holy Ghost was a person. Now this is something a great many don’t seem to understand, but if you will just take up the Bible and see what Christ had to say about the Holy Spirit, you will find that He always spoke of Him as a person—never spoke of Him as an influence. Some people have an idea that the Holy Spirit is an attribute of God, just like mercy—just an influence coming from God. But we find in the fourteenth chapter of John, sixteenth verse, these words: “And I will pray the Father, and He shall give you another Comforter that He may abide with you forever.” That He may abide with you forever. And, again, in the same chapter, seventeenth verse: “Even the Spirit of Truth, whom the world can not receive, because it seeth Him not, neither knoweth Him; but ye know Him; for He dwelleth with you and shall be in you.” Again, in the twenty-sixth verse of the same chapter: “But the Comforter, which is the Holy Ghost, whom the Father will send in my name, He shall teach you all things, and bring all things to your remembrance whatsoever I have said unto you.”Observe the pronouns “He” and “Him.” I want to call attention to this fact that whenever Christ spoke of the Holy Ghost He spoke of Him as a person, not a mere influence; and if we want to honor the Holy Ghost, let us bear in mind that He is one of the Trinity, a personality of the Godhead.THE RESERVOIR OF LOVE.We read that the fruit of the Spirit is love. God is love, Christ is love, and we should not be surprised to read about the love of the Spirit. What a blessed attribute is this. May I call it the dome of the temple of the graces. Better still, it is the crown of crowns worn by the Triune God. Human love is a natural emotion which flows forth towards the object of our affections. But Divine love is as high above human love as the heaven is above the earth. The natural man is of the earth, earthy, and however pure his love may be, it is weak and imperfect at best. But the love of God is perfect and entire, wanting nothing. It is as a mighty ocean in its greatness, dwelling with and flowing from the Eternal Spirit.In Romans v, 5, we read: “And hope maketh not ashamed, because the love of God is shed abroad in our hearts by the Holy Ghost which is given to us.” Now if we are co-workers with God, there is one thing we must possess, and that is love. A man may be a very successful lawyer and have no love for his clients, and yet get on very well. A man may be a very successful physician and have no love for his patients, and yet be a very good physician; a man may be a very successful merchant and have no love for his customers, and yet he may do a good business and succeed; but no man can be a co-worker with God without love. If our service is mere profession on our part, the quicker we renounce it the better. 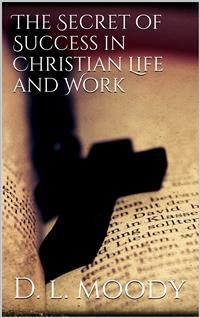 If a man takes up God’s work as he would take up any profession, the sooner he gets out of it the better.